Contacts can be displayed in two views: A single column list view, or a multi-column table view that allows you to control the columns displayed (e.g. company, last name, first name, email, phone, etc.) and the sort order. Tags are an extremely flexible way to manage contacts in BusyContacts. You can assign multiple tags to each contact and a tag cloud allows you to easily filter the list of contacts by tag (e.g. family, client, prospect, coworker, etc.). The Activity List shows a chronological listing of activities associated with the selected contact including meetings, to dos and other calendar events, communication through email and messaging, and social network posts. BusyContacts integrates with BusyCal allowing you to link contacts to events and to dos in your calendar, providing flexible CRM capabilities for scheduling meetings, follow up tasks, and tracking past activities. BusyContacts syncs with leading social networks including Facebook, Twitter and LinkedIn, allowing you to integrate photos, birthdays and other information from social networks with your contacts. Smart Filters are a powerful tool for filtering contacts and creating saved searches that can be applied with a single click. You can create Smart Filters to display contacts that match certain conditions, such as a text string, tag, or birthdate. Or you can create Smart Filters to remember view settings such as columns displayed and sort order. 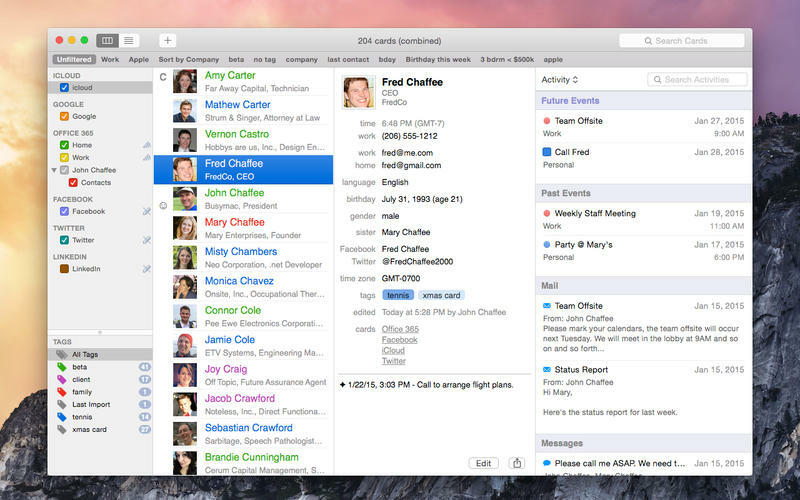 BusyContacts syncs with all leading cloud services including iCloud, Google, Exchange, and other CardDAV servers, and syncs with the built-in Contacts app on OS X and iOS. BusyContacts allows you to share address books with other BusyContacts users with read-only or read/write privileges. Address Books can be shared through Exchange, Fruux, Kerio, over the LAN, and through other CardDAV servers that support sharing.